The Navy has officially confirmed that there will be a college basketball game played on the aircraft Carl Vinson this coming Veterans Day. Two of the NCAA’s most storied programs, North Carolina and Michigan State, will square off on Nov. 11 on the flight deck of Nimitz-class flattop. The Vinson gained worldwide notoriety earlier this year after it hosted Osama bin Laden’s funeral and burial somewhere in the Arabian Sea after Navy SEALs killed the al-Qaida leader. Magic Johnson and Michael Jordon are expected to be honorary captains for the game, according to AP. ESPN will be broadcasting the matchup. If you’re looking to get a ticket, good luck. There will be no public sales, and the approximately 7,000 tickets will be distributed among sailors, their families, wounded warriors and the two schools. 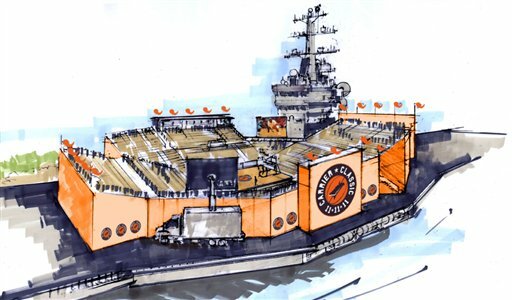 I may be in the minority here, but I can’t understand the appeal about playing a basketball game on a docked aircraft carrier. Might as well just play on a playground by the beach. Now if it was at sea, then yeah, that would be awesome. The players could be flown on C-2s, Tom Izzo and Roy Williams could come in Super Hornets — let’s make it a real Navy experience. It’d be expensive, but we’ve wasted money on dumber things. This is just plain dumb. The Navy defends its huge navy carrier battle groups and this is one of their “vital” missions. It is a huge, unnecessary publicity stunt that benefits few people, spends tax dollars unnecessarily (despite the sponsorship claims), and once again proves the fiscal largesse of the Department of Defense and the Navy. Ridiculous.